Learn the basics of pruning many common trees, bushes and vines from this handy manual. 32 pages. Buy 5 or more and save! Discount applies to any Country Wisdom Bulletin; you can mix and match..
Do you have an old grapevine that needs training? A forsythia that has become too leggy? Have you just purchased a new home and felt mystified by the pruning chores ahead? The subject of pruning can fill a whole book and sometimes even the experts disagree over the best practices. But the principles of pruning are simple. This bulletin tells you how to keep your trees shrubs and vines attractive and healthy through careful pruning. What is pruning? It is cutting away unwanted parts of a plant for better shape or more fruitful growth. 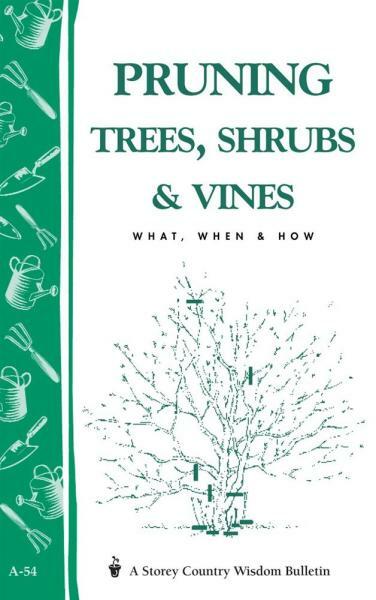 Pruning Trees- Shrubs- and Vines Book Learn the basics of pruning many common trees, bushes and vines from this handy manual. 32 pages.